Apple Music started rolling out across Israel today, over a year after the streaming service was launched in 110 countries simultaneously. The splash screen for a three-month free trial began appearing on Macs and iOS devices for a number of users in the country this morning. Once the free trial is up, Apple's individual plan starts at 19.90 ILS ($5.21) per month, with a family plan costing 29.90 ILS ($7.83), putting Apple Music at a similar price point as existing services in the country, such as Pelephone Musix. Rumors that Apple Music was coming to Israel first appeared in November last year, although initially it was thought the service was debuting in the first quarter of 2016. In June, it was reported that Apple was gearing up to launch the service in Korea next, although the company still has some strict copyright law hurdles to overcome in the country. Apple's streaming music service is an evolution of the Beats Music service it acquired in 2014, and has steadily gained listeners over the past 12 months, reaching over 15 million paying subscribers as of WWDC 2016 in June. Currently it is available in over 100 territories including Africa, the Middle East, India, Asia, Europe, Latin America, the Caribbean, the United States, and Canada. 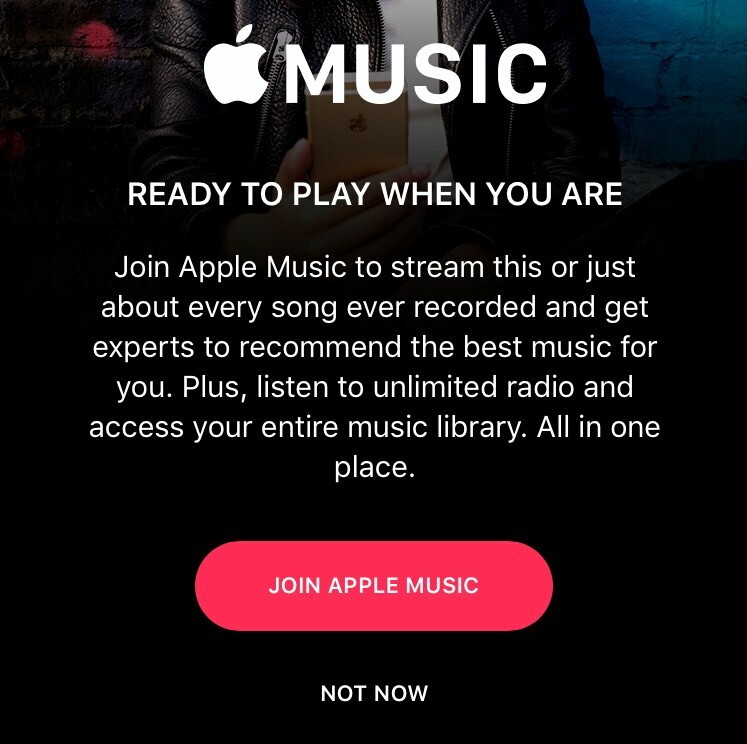 With iOS 10, Apple is revamping the design and UX of the Apple Music app, aiming to give its content and features a more logical organization, introducing a new section for downloaded music, and making the Connect aspect of the service less prominent. Steve Jobs would've never launched AM in Israel. "Apple Music launches in another country" is the new "Apple Pay launches in another store". Does anyone know if the transition of Apple Music matched songs to iTunes Match-like non-DRM files is finally complete for everyone? Where to even check something like that? Definitely don't plan to drop Spotify, but I might finally give the trial a go. You should wait a couple of months and try it after iOS 10 launches. Personally I've never had issues with iTunes Match but by then I suspect they'll have completely transitioned to the new way of matching songs and you'll also get the benefit of the more streamlined UI. These are great prices, wow. I am in Israel and used the American store so far, but will definitely use the Isrseli store from now on. Does anyone know if I can transfer an existing account between stores? The music library is extremly smaller then the US store. All the music i was used to hear with my US account does'nr exist at the IL Apple Music. Once the free trial is up, Apple's individual plan starts at 19.90 ILS ($5.21) per month, with a family plan costing 29.90 ILS ($7.83), putting Apple Music at a similar price point as existing services in the country, such as Pelephone Musix ('https://translate.google.com/translate?hl=en&sl=iw&u=https://www.pelephone.co.il/digital/3G/corporate/digital/store/contentproducts/musix/.aspx&prev=search'). In June, it was reported that Apple was gearing up to launch the service in Korea ('https://www.macrumors.com/2016/06/23/apple-music-launch-in-korea/') next, although the company still has some strict copyright law hurdles to overcome in the country. For every israeli that see this. If you are using an US apple music, Dont switch to the israeli store! The music library is extremly smaller than the US apple music service! All the music i used to hear with my US account simply doesn't exist.